Lukosevicius Out to 'Prove Them Wrong' - College Hockey, Inc.
One of two seniors a crucial leader for Denver. Jarid Lukosevicius has eight NCAA Tournament goals in his career (Photo by Larry Radloff). By his own admission, Jarid Lukosevicius has said the three words a lot since September. They come up. Often. They are as prevalent as the 24 year-old forward’s long hair and ability to make college hockey’s final weekend, the words showing up on the door outside Denver’s locker room at KeyBank Center. It’s his motivation. 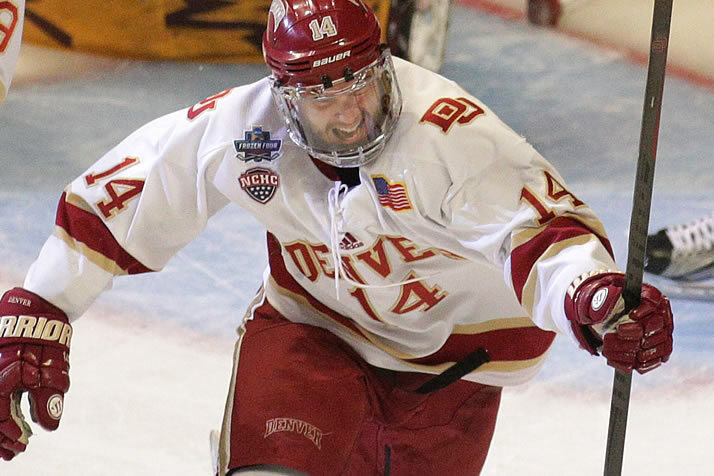 Lukosevicius, one of two seniors on the 2019 Pioneers, will be appearing in his third Frozen Four when Denver faces Massachusetts on Thursday. DU won the national championship in 2017. Despite high expectations to repeat, the team fell one game short of the 2018 Frozen Four followed by early departures to the NHL ranging from Henrik Borgstrom to Troy Terry to former head coach Jim Montgomery. Relishing being in position to show the talent and success this season he saw on Day 1, Lukosevicius gets another opportunity to win a national championship. Fittingly, the 2017 Frozen Four Most Outstanding Player is the first returning MOP since Minnesota’s Grant Potulny (2003), the last time the Frozen Four was held in Buffalo. Two years later, Lukosevicius continues to give all the credit to his linemates for his 2017 national championship game hat trick. At the same time, bringing that experience helps DU and Lukosevicius, who went undrafted but attended Vancouver Canucks prospect development camp last summer. While the Squamish, B.C., native believes he doesn’t need to change to be a leader, his teammates have noticed one throughout Lukosevicius’ four years playing college hockey. “I've gotten the opportunity to grow up with Luko here. He's grown up so much as a hockey player, even more so as a person,” said Denver senior captain Colin Staub. “He was a great player throughout the first two years, but the more that he's played, more as a junior and senior, he's definitely grown to be more of a leader on this team. Lukosevicius’ competitive nature comes out whether he’s on the ice or playing board games with roommate Ian Mitchell. It makes him a key component for the Pioneers on a team with 19 underclassmen. “I’m an honest person. Tell it straight up. If someone is having a bad practice, I’ll tell them,” he said. “Stuff like that. If I’m having a bad practice, I’ll be mad at myself. The best leaders I saw they never changed who they were. They talked a lot in practice. They practiced their heart out in practice so they practiced like they played in games. Like first-year head coach David Carle, who sees himself as the same coach outside of a new office and title, Lukosevicius has a new role as an alternate captain. However, from a preparation standpoint everything else remains the same. The lessons learned from being scratched seven times his freshman season. His development into Denver’s leading goal scorer with 19 this season. His maturation throughout his time in college that spark dividends outside the stat sheet, a three word mantra that so far has proved to be exactly right what they need. “As (Jarid)’s matured as a person, he realized the more responsible he can be on the ice, the more he can pay attention to all of our details, the more opportunity he's going to have to make an impact on the game,” Carle said. “So I think it started with mental maturity, then that has led to his ability to execute on ice for us. He's played in a lot of big moments throughout his career at Denver.